The smaller cities of central Hessen are lovely. Wrapped around deeply cut river valleys of the Lahn, Fulda, and other rivers, several cities there were built more vertically than horizontally. 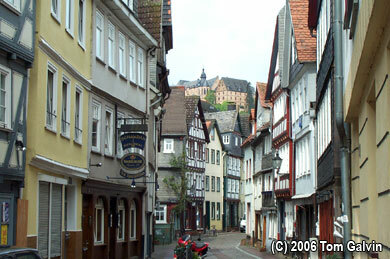 Few towns demonstrated that idea better than Marburg, whose University once claimed the famous Brothers Grimm as faculty (see Downtown Kassel). 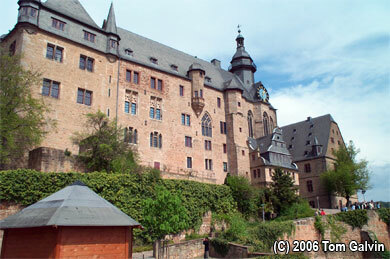 With its old town glued to a very steep hillside and topped with the magnificent Landgrafenschloss (see first photo), Marburg was a mountain goat's dream. The good news was that if one was not up to doing some serious climbing to reach the wonderful old town, there were other options. For me, the good news was that I got a lot of great exercise that day. 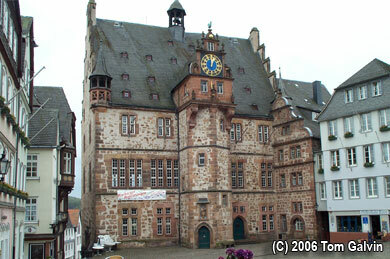 I spied Marburg from a train window on the way elsewhere, taking great interest in the palace. 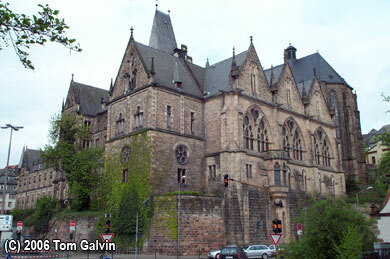 The train tracks wrapped all the way around the bend in the Lahn surrounding Marburg, so I watched the palace closely as the train curved around. So I had a good idea what kinds of pictures I wanted to take. The challenge was finding the perfect spot -- which took me on a wide circular route around the outskirts. The first photo was taken from one of the bridges crossing over the Lahn, and it was there that I spied a medieval tower (the Kaiser-Wilhelm Turm), located on top of the opposite ridge. Figuring that would provide a great view of the city, I climbed that ridge -- along a marked foot-trail that zigzagged all the way up. I was not disappointed. The view from the Turm was fantastic, if only it hadn't been spoiled by fog and light rain by the time I ascended. A restaurant also resided at ridge side, offering a better angle on the city, and both could be accessed by car. Walking on down, I completed my tour of the outskirts along the Lahn. The next two photographs show some of the highlights. 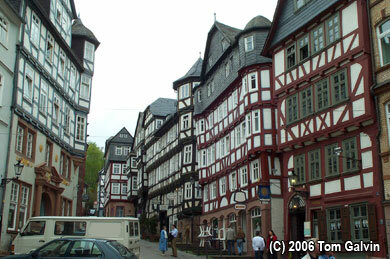 One was Weidenhaeuserstrasse, a long commercial street that followed the river. As the second photograph shows, Weidenhaeuserstrasse was lined with old half-timber buildings that housed storefronts below and residential apartments above. The street ended near the Tourist Information Bureau, so it was not a difficult street to find. However, as my visit fell on a Sunday, there was sadly little activity. Another highlight was the massive Philip's University building, shown in the third photo. This huge structure sat at the foot of the hill leading to the old city, and it included a massive chapel and museum. This was supposedly where the Brothers Grimm set up shop in the mid-18th Century. The river banks near the University building housed what appeared to be the "new city" -- with the trendier bars, restaurants, and shops. Compared with the older structures around town, this area looked brand new with stylish walking bridges over the canals and fancy outdoor cafés, huge movie kinos, and big department stores. Yet another was the beautiful Church of Saint Elizabeth in the north, close to the train station. The church had beautifully decorated doors and the interior has been recently refurbished. Surrounding it were a number of other old structures, including a bishop's palace and the shell of a bombed out chapel. I climbed into the old city from the University building and found it to be a veritable maze of tight, winding cobblestone streets and steep staircases. Many of the streets toward the bottom were lined with very colorful storefronts, not much unlike the main market square shown in the fourth photo. The architecture was either classic Hessian half-timber or rococo. I took special note of one building with a plaque mounted on the side claiming to have been once the residence of the famous Martin Luther back in the 16th Century. I also took special note of the fact that cars and buses were allowed to travel through much of the old city. It was amazing to watch as the streets were about as tight as any I'd seen in Germany, yet the buses never hit anything! Yikes. At first glance, the climb up to the old town would probably seem daunting. The good news was that there were elevators that ran from the Tourist Information Center at the river level up to the entrance way to the main market square. No mountain goating necessary. Some of the highlights from the old town included the Town Hall, shown in the fifth photo sitting at the lower end of the main marketsquare. There were also the Lutheran Church of St. Mary and the extravagant Gasthaus Zur Krone, where I opted to eat lunch. I finally made my way up to the Landgrafenschloss when the skies cleared out for a good hour. The view in the sixth and final photo was from the top of the final staircase on the southern side, near a landing that hosted a café. I ventured around the outer wall to capture the views, then went inside. The Schloss was a fabulous museum, with the university building (the A-shaped building at the far right of the sixth photo) having five completely different exhibits on its five floors -- including Hessian dress and customs, furniture, arms and weaponry of medieval knights, ancient clay pottery from the days of Roman occupation, and porcelain works. Porcelain and jewelry were also on display in a separate exhibit in the main building, that also brought visitors on a circular route through the palace's chapel, ballroom, and original foundations. The chapel was particularly interesting as the curators clearly sought to maintain the original (and very faded) frescoes painted on the white walls of the interior. Off to the left of the sixth photo was where the Schlosspark resided, a simple grass park with vista points. In the center appeared to be an outdoor concert hall, marked with three sandstone arches that were clearly modern in design. A number of locals were out doing circuits around the park. I did one circuit and began the long arduous climb down back to the train station. Once there, I definitely felt the day's climbing in my legs! Marburg was quite unique among the places I have visited. 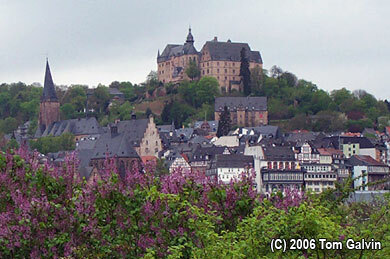 True, there were plenty of places around with half-timbered buildings, steep cobblestone streets, and great views, but the very severe grades that this city was built on and the way it embraced the hillside made Marburg very memorable. I'll remember for sure, especially every time my legs ache from another long climb!